WWF Wrestlemania is a sports title and the first fully-licensed WWF videogame. It consists of a 1-2 player Standard mode (single matches), as well as a 1-6 player Tournament mode (15 match competition). The available wrestlers are Ted DiBiase, Bam Bam Bigelow, Honky Tonk Man, Randy Savage, Andre the Giant, and Hulk Hogan, and each has a specific move set that includes Bodyslams, Dropkicks and Headbutts. Upon starting a match, it immediately feels strange to be competing in an empty arena (represented by a pure black background) and the lack of atmosphere extends to the crowd SFX which are entirely absent. The wrestling is just as anaemic as you can't grapple, and close quarters combat is complete luck as to who takes damage. It's so poor and unpredictable that matches usually consist of both wrestlers running between the ropes while trying to flying kick their opponent! Attempted pins register infrequently and some wrestlers even have a different pin button which is confusing! Continuing the theme, the turnbuckle moves are ridiculous and simply climbing the ropes is unintuitive; you'd expect to reach a corner and then press a button, but not here. Instead, you must sprint towards the ropes and then press the B button the split-second you reach the turnbuckles! It's completely unnecessary and is yet another reason why you'll be flailing around the ring like an idiot. There's also a paltry number of moves and wrestlers to choose from, and some (e.g. Ted DiBiase) aren't worth picking as they're so slow and underpowered. Others are far too dominant, especially Andre the Giant, who can zip around the ring despite being over 7 feet tall! The only positive is the music which features good renditions of each wrestlers' theme tune. WWF Wrestlemania is a shambles due to its perplexing button layouts, ill-conceived combat mechanics and unbalanced characters. Winning the championship belt takes more luck than it does skill, but the real challenge comes from trying to stay awake long enough to endure the highly repetitive and bland gameplay. 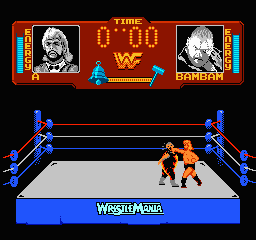 Random trivia: Rare also developed the follow-up game called WWF Wrestlemania Challenge (1990, NES).